This is my favourite style and one I’ve been trying to approximate a lot over the last year or so. 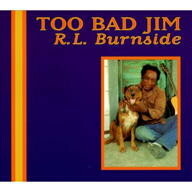 R. L. Burnside was a big discovery for me. Seeing him as well as JJ Cale and Bruce Cockburn prompted me to ditch the guitar pic for good. My Chinese guitar teacher indeed most teachers try to get me to use one, but I’m way better and way more expressive without it. I’ve been working hard on using the whole neck and a bastardized classical picking style on my right hand. I can play with one, two, or three fingers and I like to switch between all three styles as well as incorporating using my fingernail for more chime and volume and even some plucking when I want to get funky. Having seen Grady this week I need to work on switching from slide to fretting normally. I forced myself to learn to play slide on my pinky. I don’t use any special tuning, my guitar is usually not in perfect tune. I’ve been doggedly pursuing my own style for years now, but also trying to learn anything I can from Chinese folk songs to weird Jazz chords. I seem to have developed the bad habit of resting fingers on strings, but I also kinda use it to my advantage and only play a few strings at a time muting the rest completely. My guitar playing including slide did get better, then I sacrifice guitar playing and many other enjoyable hobbies in order to focus on passing the CFA® exams. I managed to do it, but I can not say it was worth it. I did not get a new job and I’m so tired of applying to jobs online. I’m also tired of editing ten years old blog posts to try and improve my search engine optimization. This entry was originaly posted on October 17th, 2009 , it was last edited on April 1st, 2019 and is filed under: The Arts and tagged: JJ Cale, North Mississippi, R. L. Burnside, Slide Guitar, The Blues.